Despite an overwhelming scientific consensus, climate change remains one of the most controversial issues of our time. Focusing on the rhetoric that surrounds the issue of climate change, this groundbreaking book analyses why the debate continues to rage and examines how we should argue when winning the argument really matters. Going beyond routine condemnations of the wildest statements made by religious fundamentalists or spokespeople for fossil fuel interests, the book explains the mutually exacerbating problems that permit many of us greet catastrophic predictions with an equivocal shrug. It argues that the argumentative situation around climate change makes a certain kind of skepticism – "fair-minded skepticism" – not only possible but likely. The book also strikes a hopeful note, reminding us that people do change their minds in response to effective argumentation that appeals to deeply shared values. 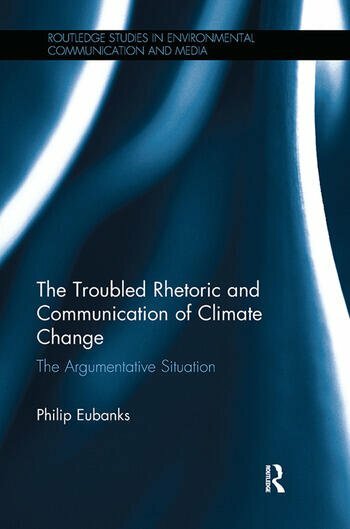 Offering new insight into an ongoing academic discussion about the nature of argument and how it can be undertaken more effectively and ethically, as well as a new perspective on the rhetoric of science and technology, this book will be a valuable resource to students and scholars of climate change, environmental humanities, rhetoric, environmental communication, sociology and science and technology studies. Philip Eubanks is Professor of English at Northern Illinois University, USA.